hi, y'all! sorry, my southern accent is hanging around still from the one hour i spent in the dallas airport ... hey, did you guys know everything's bigger in texas? anywho! let's get back to our regularly scheduled programming with a feature i like to call : yet another boring sushi post. ok, i'm sorry. there is absolutely nothing wrong with lakeview's "contemporary sushi restaurant" : rollapalooza ... my rolls were great! i just know people get bored with the same thing over & over again. but fear not! after this -- i've still got one fab nyc post coming up + some amazing chi-town restaurants + some amazingness all the way from maui! hello, sunshine! 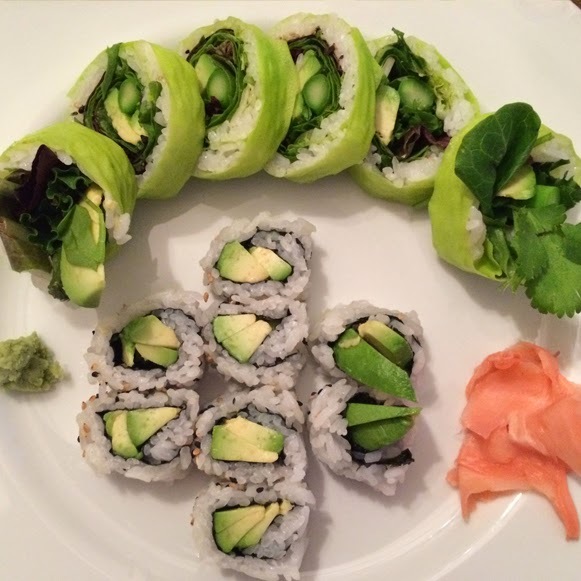 green arrow : cilantro, avocado, asparagus, radish sprouts, baby spring greens & green soy paper. green arrow = delicious. avocado = delicious. you can't go wrong with either of these items when in the mood for something light & sushi-tastic. so guys, rollapalooza is definitely worth checking out ... i ordered delivery (shocking! ), so i can't attest to in-house dining. who wants to give it a try? ?